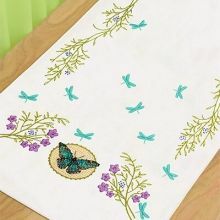 Printed Table Runner with Hemmed Border, Embroidery Fabric: 100% cotton, Yarn: 100% cotton DMC, Yarn organizer, Instruction in four/ eight languages, Large-square design - Needle - Frontsheet picture, The printed design will wash out, Pre-finished, ca. 38 x 142 cm / 15.2" x 56.8", Age category: from 9 years, Stitches: cross stitch, stem stitch.. Pretty flowers and berries on this stamped cross stitch table runner make the perfect accent for any room. Rich colors of cotton thread make up this beautiful design that's suitable for any room. Our package includes a pre-edged table runner printed in wash-away ink, a shopping list for thread, and easy instructions. Finished Size: 15" x 44" (38 x 112 cm).. Printed Tablecloth with Hemmed Inwoven Border, Embroidery Fabric: 100% cotton, Yarn: 100% cotton DMC, Yarn organizer, Instruction in four/eight languages, Large-square design, Needle - Frontsheet picture, The printed design will wash out, Pre-finished, ca. 80 x 80 cm / 32" x 32", Age category: from 9 years, Stitches: french knot, cross stitch, long stitch, back stitch.. Your holiday decorating will be complete with this elegant Christmas Greens Table Runner by Dimensions. Poinsettias, holly, and evergreen sprigs comprise this stamped cross stitch beauty. Size: 15" x 44" (38 cm x 112 cm). This stamped cross stitch kit contains: Cotton table runner printed with wash-away ink, Easy to follow instructions, Thread list on package..
Aida Tablecloth with Chart, Embroidery Fabric: 100% cotton, Yarn: 100% cotton DMC, 4,2 stitches/cm - 10,5 count, Yarn organizer, Instruction in four/eight languages, Large-square charted design, Needle, Frontsheet picture, Pre-finished, ca. 80 x 80 cm / 32" x 32", Age category: from 9 years, Stitches: cross stitch, back stitch.. Printed Tablecloth, with Hemmed Inwoven Border, Embroidery Fabric: 100% cotton, Yarn: 100% cotton DMC, Yarn organizer, Instruction in four/eight languages, Large-square design, Needle - Frontsheet picture, The printed design will wash out, Pre-finished, ca. 80 x 80 cm / 32" x 32", Age category: from 9 years, Stitches: french knot, cross stitch, stem stitch, back stitch.. Printed Tablecloth and Runner, with Hemmed Inwoven Border, Embroidery Fabric: 100% cotton, Yarn: 100% cotton DMC, Yarn organizer, Instruction in four/eight languages, Large-square design, Needle - Frontsheet picture, The printed design will wash out, Pre-finished, ca. 40 x 100 cm / 16" x 40", Age category: from 9 years, Stitches: cross stitch, long stitch, stem stitch.. Printed Tablecloth with Hemmed Inwoven Border, Embroidery Fabric: 100% cotton, Yarn: 100% cotton DMC, Yarn organizer, Instruction in four/eight languages, Large-square design, Needle / Frontsheet picture, The printed design will wash out, Pre-finished, ca. 80 x 80 cm / 32" x 32", Age category: from 9 years, Stitches: cross stitch, back stitch..